GEORGE B. DERTILIS, born 1939, is member of the Academia Europaea and Professor Emeritus of the University of Athens. He taught modern and contemporary history at the University of Athens and, as visiting professor, at Harvard, Oxford, and the European University Institute, Florence. He served as member of the board in numerous research institutions and cultural foundations, Greek and French. He has published 14 books and over 50 articles and essays. In 2000, he was elected at the École des Hautes Études en Sciences Sociales, Paris. Since then he lives in France, where he was conferred the French nationality and the distinction “Palmes Académiques” (chevalier). “The Crisis in Greece: a Long-term Political Problem”. Interview in To Vima, Athens, April 30, 2011 (in Greek). “La crise en Grèce : interroger le passé, penser l’avenir”. Conference at the Institut Français d’Athènes, February 3, 2011. Published in The Athens Review of Books, April 2011 (in Greek). “Kostas Axelos : Le destin de la Grèce moderne et quelques fragments sur la démocratie“. Conference at an evening in memory of Kostas Axelos, Paris, 28 February 2011 (in French). “Economic Crises and the Greek State: a History neither Repetitive nor Instructive”. Annual lecture at the Hellenic Foundation of Defence and Foreign Policy (ELIAMEP ), Athens, March 4, 2010 (in Greek). “Dette publique et dépenses militaires: la Grèce et la Question d’Orient”. Un texte français sur la période 1830 – 1905. Ιστορία της νεώτερης και σύγχρονης Ελλάδας, 1750-2015. 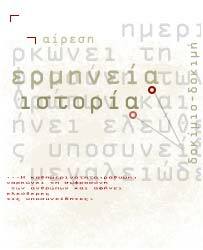 Crete University Press, 2018 (948 pages, 35 €). Dertilis describes the formation, almost ex nihilo, of the Modern Greek state. He shows convincingly how […] a new society and a modern economy are gradually structured around this new State, and how the social actors serve or defy the state institutions in order to re-structure them according to their interests. […] Interpreting rather than simply describing events, he often arrives at unexpected or even heretic conclusions. […] His method, comparative and multi-disciplinary, allows him to use sources usually unnoticed or neglected, and to rightly suspect sources usually considered as reliable. […] Rejecting facile explanations, he proposes interpretations founded on what he calls a “causal plexus”, a complex and dynamic set of historical processes, during which causes intertwined with effects develop in a spiral of mutation, change, and evolution. […] Dertilis’s book shows the need for a history of Europe that would take into consideration the more ‘peripheral’ European regions, those most neglected by historians. 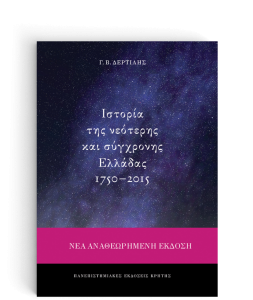 A monumental edition, this book describes exhaustively […] the historical processes that have structured the Modern Greek state. Avoiding linear explanations and arid listings of dates, names and events, the author unravels the complex causal relations forming what he calls a “causal plexus”. […] Solid theoretical foundations, a well mastered large bibliography, and a very elegant style. An impressive volume of data and of archival documents, a rigorous method, and an impeccable, elegant text. […] An experiment in “histoire totale”, Dertilis’ book demolishes the disciplinary barriers between the Social Sciences.